Sure, in an ideal world the police shouldn't be able to abduct a child from his loving parents, but who are we to question the state? Come on, church. Stop hiding behind Romans 13 and speak up. Franklin Graham: Changing Hearts at the Point of a Gun? No, Franklin Graham did not exactly say he wanted to change people's hearts at the point of a gun. However, he did suggest taxing violent entertainment in an effort to... Oh, I don't know. Make our nation appear more "Christian," I suppose. But what is a tax if not a threat to use state-sponsored violence against those who fail or refuse to comply? Evangelist Franklin Graham has stated that a solution to the problem of violence in American culture could be a tax on violent entertainment. The CEO of the international relief group Samaritan's Purse stated this in some remarks delivered Wednesday at Camp Bethelwoods in York, S.C.
"How much violence as a nation are we willing to accept?" asked Graham, who was present in York to speak about this and other issues to those involved in a Samaritan's Purse disaster relief training event. "We tax cigarettes, we can tax violence … only God can change your heart. We need to bring God's laws back into society." Yes, "only God can change your heart," but in order for that to happen "we need to bring God's laws back into society." In other words, we can change hearts at the point of a gun. As Christians, let's quit looking for salvation through legislation and instead focus our efforts on spreading the gospel. After all, it is the power of the gospel that will actually change hearts, not laws that must be enforced through the threat of violence. Does the Great Commission negate Calvinism? A more formalized online debate on that topic has begun here. 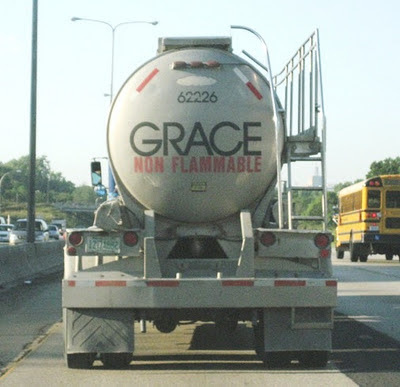 Offended by a "militant Calvinist" who said he would burn in Hell for denying the doctrines of grace, one man has come to the conclusion that Calvinism is "repugnant, unbiblical and possibly even heretical." Another example of why we need to be loving in our defense of biblical truth. Did you know that Calvinism denies scripture, the new birth, and the Trinity? Neither did I. Check out Solid Joys, a daily devotional site featuring 365 excerpts from the writings of John Piper. It's nice to see that Tominthebox New Network is up and running again after a year-long hiatus. Great to have you back, Tom! My wife and I have been members of Bethlehem Baptist Church for several years and have greatly appreciated the biblical teaching of John Piper. This video was shown at a celebration service thanking Pastor John for his years of ministry and praising God for what He has done. Roger Olson describes a relational view of the sovereignty of God. This view "regards God's will as settled in terms of the intentions of his character but open and flexible in terms of the ways in which he acts because he allows himself to be acted upon." The death of New Calvinism? Baptist colleges can't accept Baptist theologians. The main reason Arminians reject Calvinism is this: "A forced relationship is not a loving relationship." Uh, yeah. That's exactly what Calvinists teach. I'm convinced that one of the main reasons people reject Calvinism is their denial of total depravity. John Piper looks back on 33 years of pastoral ministry. God is sacrificial. He is love. He empties Himself upon the cross, and restrains Himself in preservation of our free choice. In the end, we enter that city only because He has made the way possible, and because we have chosen to walk through it. In other words, Christ's sacrifice didn't secure salvation for anyone; it only made salvation possible. If humans are incapable of resisting His saving grace, then He is responsible for not saving them all, since it's completely within His power to do so, and no one else has any say in the matter. It's not a matter of what we humans deserve so much as a matter of impartiality in justice, and completeness in mercy. I can't believe that God exercises partiality in justice and limited mercy. ... I think we can't come to God unless He draws us-- but when He draws us, we can choose to come towards Him, or resist and insist we don't want God. Simple as that. The Resurgence blog has a weekly feature called Resurgence Roundup. Check out this week's post here. Calvinists may look like normal people, but what are they hiding? Miss Phil Johnson? Don't worry. Team Pyro features classic posts from Phil every Friday. Turns out it's just a hoax. *Whew! * What a relief! Yeah, I fell for it. I mean, I was really starting to believe that Osteen had abandoned the true gospel message in favor of some whitewashed version of the prosperity gospel. It's nice to know that couldn't be further from the truth, and that Lakewood Church remains a bastion of Word-centered preaching. Could Gay 'Marriage' Lead to Father's Marrying Their Sons? Why couldn't a father marry his son? What would be the moral basis for denying such an arrangement? The lack of answers to questions like this shows just how little reasoning has gone into the issue on the part of the tolerance crowd. Apologia Radio interviews John Samson, author of Twelve What Abouts: Answering Common Objections Concerning God's Sovereignty in Election. It seems the flap over Calvinism at Louisiana College began when a number of students expressed their "'very oppressive discomfort' that they have felt with regard to the advocating of Calvinistic tenets." Rob Davis continues explaining what he thinks is wrong with the New Reformed movement. In a word, the problem is "guilt." Apparently, speakers at the most recent John 3:16 Conference discussed Calvinism. Go figure. James White responded on his podcast (mp3). Steve Swan, associate pastor at The King's Fellowship, explains how he can be a Calvinist and still be into evangelism. "Those are astronomical numbers. I'm floored," said Dr. William Graf, a pediatric neurologist in New Haven and a professor at the Yale School of Medicine. He added, "Mild symptoms are being diagnosed so readily, which goes well beyond the disorder and beyond the zone of ambiguity to pure enhancement of children who are otherwise healthy." Don't worry. The American Psychiatric Association is planning on changing the definition of A.D.H.D. so that even more kids will be diagnosed in order to receive proper "treatment." Call it an economic stimulus for the pharmaceutical industry. As a father of three, I am thankful that we are able to homeschool our kids. I'm sure many of you parents will know exactly what I'm talking about when I say that there is a strong likelihood that each one of my children would fall under some government school definition of A.D.D. or A.D.H.D. But have you ever met one kid who didn't have trouble sitting still or focusing, especially when they had little or no interest in the subject being taught? If your kid is squirming in public school, a solution is to pull him out of public school. Kids who are not in public schools usually stop squirming. There are two main solutions: homeschooling or doing chores around the house. Teenage kids facing this choice usually stop squirming. Homeschooling works. But when it's either prescribing drugs or chores, I recommend chores. It's cheaper. Also, parents avoid extra chores. So simple, and yet so difficult for today's two-income families to manage.